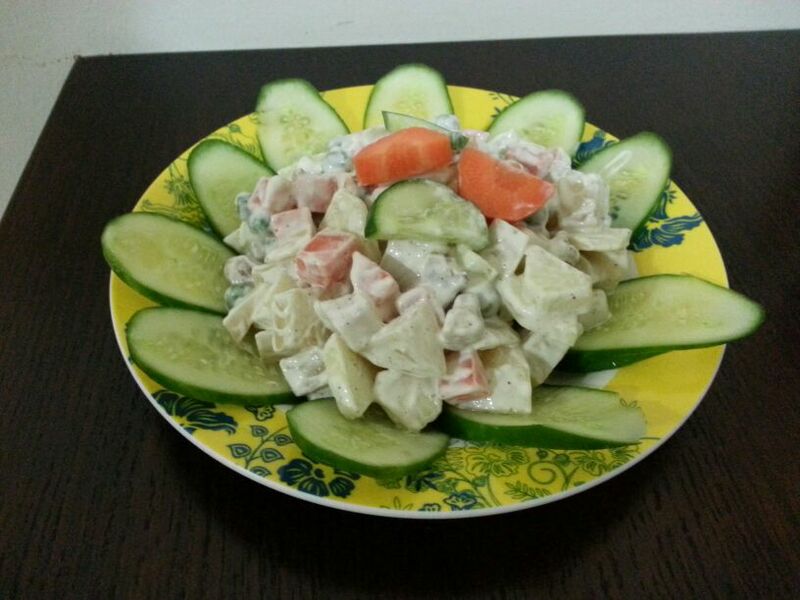 Russian Salad is a creamy and yummy salad. It is very easy to prepare. 1. Wash the diced potatoes and boil them till cooked but not too soft. Drain water and add to a bowl. 2. Wash and boil the diced carrots till cooked but not too soft. Drain water and add to the potatoes. 3. Boil the green peas. Drain water and add to the potatoes and carrots. 5. Add the diced apple and pineapple to the bowl. 6. Add the walnut pieces and raisins. 7. Mix well to combine. 8. Add salt and pepper and mix well. 9. Add mayonnaise and cream and mix well. 10. Add lemon juice and mix well. 11. Cover and refrigerate to chill until serving for at least 1.5 hours or longer. 12. When ready to serve, place torn lettuce if using on the serving plate. 13. Mix well and place the salad over the lettuce bed. 14. Place cucumber slices if using around the salad.